Back in December, when the bitcoin - and crypto - train was rushing along full speed to a (very brief) date with $20,000, a bevy of small and micro-cap companies jumped on board using a simple gimmick: just add the words "blockchain" or "crypto" to their name. The best example of the irrational exuberance of this period, the gullibility of investors, and how this simple "strategy" worked miracles if only for a short time, was the company formerly known as Long Island Iced Tea which in mid-December changed its name to Long Blockchain. The result was a 500% surge in its shares. Nine months later the crypto bubble may have popped (Long Blockchain was last trading at 19 cents), but the shortcuts to rapid stock price appreciation remain, thanks to the new bubble that has emerged to replace cryptos: cannabis. Consider the following examples: New Age Beverages shares tripled this month; Alkaline Water stock doubled; while IntelGenx Technologies did that in a single day last week. How did they do it? Simple: as Bloomberg summarizes, while on the surface, the companies have almost noting in common - one makes trendy Kombucha drinks, another pH-balanced water, while the last makes oral films for medications - they all plan, or at least hope, to become the next Tilray if only in terms of its stock price, and capitalize on the legal cannabis market that has fascinated investors in recent weeks, by "developing" cannabis related business lines. 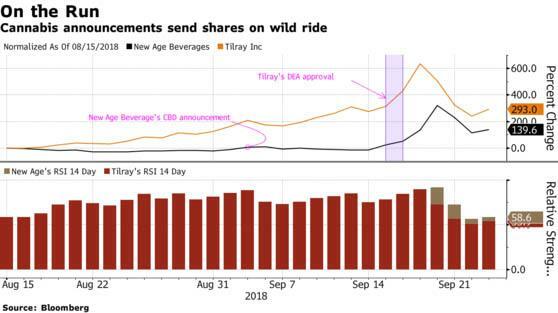 In a flashback to the gimmicks (ab)used by crypto companies, New Age Beverages saw its stock spike after a conference presentation earlier this month where company executives showed a slide titled "Tested CBD Beverage in CO," referring to drinks infused with marijuana-derived cannabidiol. The stock added $14.5 million to its market capitalization that day alone, ending the session at $94.4 million. Separately, yet in very similar fashion, the maker of Coco Libre coconut water and Bucha Live Kombucha also announced plans to debut its portfolio of CBD-infused beverages at a trade show for convenience stores in Las Vegas next month. This was enough to catapult the stock price, and the California-based New Age now carries a valuation of about $190 million. Stepping back, one can see a similar pattern across the sector: a custom Bloomberg index of the so-called WINO, or Weed In Name Only, stocks with cannabis business lines shows them outperforming the ETFMG Alternative Harvest exchange-traded fund, as well as the S&P 500, since the start of the year. The over-the-counter packaging company gained 22 percent Monday on an agreement to package cannabis-infused gummy edibles. The Jacksonville, Florida-based company said the candies "will be the first of several edibles to be packaged by Advantis." Investors in this high-alkaline bottled-water manufacturer have seen their fortunes grow by 72 percent since the company announced that new products coming to market soon will include a hemp-derived CBD-infused Alkaline88 water. Even mega-cap Coca-Cola can’t ignore this hot industry. The Atlanta-based soft-drink maker said it’s monitoring the cannabis industry and is interested in CBD-infused drinks. 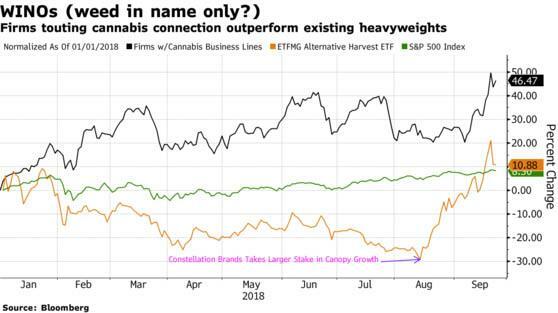 The move follows alcohol maker Constellation Brands’ multi-billion dollar investment in Canopy Growth. The biotech stock saw a 54 percent spike on September 20 after saying it licenses about 600 compounds that target the same system in the human body that marijuana affects -- even though its products are derived from synthetics and not the cannabis plant itself. Shares in Intrexon Corp., the Zika-drugmaker and genetic engineer of salmon, surged 32 percent Monday after announcing it had engineered a yeast strain to extract “low-cost, robust and consistent” cannabinoids for medical use. The maker of VersaFilm -- a medication delivery product that dissolves in a patient’s mouth -- has a non-binding letter of intent with pot provider Tilray to develop cannabis-based uses. The stock more than doubled on the announcement. The e-commerce platform is becoming the website provider of choice for Canada’s pot rollout after signing deals with several provinces and companies, including Aurora Cannabis, to host sales channels.